Shall we assume that there's nothing left of the amusement park today? Thank you for an excellent post - I live only a block away from the shopping center/former amusement park, and it was fantastic learning all of the history behind this site that I did not previously know. There is nothing left of the amusement park. You're welcome - I'm glad you enjoyed it. Duke Surplus is only open to non-profits now. If you present your 501c3 to them you can still shop there. Also, uhm, Thrift World is one of my favorite thrift shops. They have crazy and cheap furniture, random cool clothes and daily specials. Dayum. I'm in awe...I had no idea. My monthly visit to Thriftworld and Pennies for Change will never be the same. thank you! I cannot get over the Roller coaster! This is fascinating. Was there really a Winn-Dixie and Kroger in the same shopping center? That's just crazy! Nowadays that complex is so sad. Was the amusement park for whites only? Anon1 - I agree! I had no idea that roller coasters existed ~1920. Anon2 - You're right - I hadn't even noticed that they were both in the same complex. Anon3 - Probably, although it isn't specifically referenced in any of the materials I looked at. But most everything in Durham was, including the Lakewood School up the street, buses/streetcars, the Woolworth and Center theater referenced in this post, etc., etc., etc. It's my understanding that it was for whites only. Mayme Webb talks about her grandparents (African American) from West End who would go and hide in the bushes (probably at night) to observe the happenings there. When I was a little boy, there used to be an S&H Green Stamp store and a small Thalhimers in Lakewood. Are there any photos showing storefronts in that era? Also, Davis Bakery was at the top of the entrance before you hit the curve on Chapel Hill St. The shopping center is in drastic need of a revitalization of some kind. it has lost three significant draws in the last few years: as you note, Duke Surplus and the Blue Nile, and also Piedmont Decorators, a fairly high-end paint and flooring store. There's very little in there now, and other than Thrift World and Food Lion, none of the occupants seem very stable. I can't believe that even a faraway company would not recognise the value of completely redoing this location, especially given its proximity to Duke and the ongoing gentrification of the Tuscaloosa-Lakewood neighborhood (whether for better or worse). Wow - I just had no idea what used to be here. Thanks for this post. The area is of course dramatically underutilized now, with seemingly acres of unused surface parking. It's great to have Food Lion here, and hopefully they don't plan on going anywhere, but as others said - it really needs some help. I love to read the stories about the old street car system. Given the rising cost of gas, it seems like it could almost be viable once again. A group of TL neighbors has formed a committee to look at options for this 18 acre contiguous asphalt jungle. A redeveloped commercial center like it has been is not going to work. We've met with a couple of developers, and continue to seek input from others who have thoughts, comments, ideas, cash.... Perhaps something mixed use would be appropriate?. It's 18 acres, right near Duke University, and near 4 or so distinct neighborhoods. Unfortunately the property owner has split the property into a few different parcels. The primary property owner, Chris White of Alabama is one of the least cooperative and combative property owners I've ever dealt with. He invests little to nothing in the property, yet views this real estate as something grand. Food Lion is good to have nearby, but every other notable commercial tenant has abandoned the place. Throw out some ideas on this blog. We'd love to hear them. Please don't disregard Thrift World, RTS, the barber shop and other establishments in this parking lot. I agree that it is ugly and that some form of revitalization would improve the area, but one should keep in mind that a significant portion of the less well-off residents of T-L rely on the shopping center to fulfill daily needs. Food Lion is not the only useful establishment there. Thanks for this great post! I had heard rumors about an old amusement park ever since I moved to the Lakewood neighborhood, but I had never gotten to see the pictures. It looks like it was wonderful! I agree with several of the other people who have pointed out how badly in need of redevelopment this area is. I have heard that the former Krogar shopping center on 15-501 near South Square is being redevloped. It is similarly abandoned and covered in asphalt. Maybe whomever is involved in that project would have some ideas for generating new and profitable uses for the Lakewood center? Hi-- I'm a long time lurker and first time commenter and I just wanted to say this post is really superb. Well done! I've been waiting for you to post about this (especially the area) for a long time. The amusement parked has been blogged about several times, it's great to see it. It's odd to see the gas station I visit and the Pennies store and laundromat the way it was when first built. "Gentrification ... for better or for worse"? Do tell me more. I'm failing to see how TLNA is "gentrified" (at least not yet). 2. At Daniel Boone Village in Hillsborough, one of the old Lakewood streetcars is on view... I think it was from the James Freeland collection. 1. The area is improving... but the shopping center is perhaps dragging the neighborhood down. The facade of the building is horrible (it actually looks better in the 1950s pics you posted), and many of the shops are sub-par (yes, even Thrift World; their prices went up a lot, and most of their stuff these days looks like yard sale rejects). Duke Surplus was interesting, but being charged $80 for a $5 chair or $300 for a 1999 HP computer or $50 for a non-working UPS backup gets old after awhile. I'm glad they moved on. Food Lion does provide a needed service for the area; it or another grocery store needs to be in the shopping center. 2. There are great Hispanic eateries in the area (Azteca, Playa Azul, the ex-Davis Bakery, etc.). 3. There are a few very cool buildings still standing (the Davis Bakery, the other two-story brick building across the way, and the one-story ex-antiques place next door (which apparently is being renovated into a club or bar?). That's all I got! Thanks again for the excellent post! One of the biggest problems Lakewood has right now is that from a transportation perspective, it's hard to get to if you don't live in the neighborhood. Chapel Hill Rd. is a winding and somewhat confusing passage, and Anderson and Lakewood aren't exactly quick skips. This area isn't built for car traffic, which is one of the reasons it still has such nice (though not gentrified) neighborhoods around it. If Lakewood is going to thrive, it needs its old raison d'etre: public transit. The crazy idea I have for this area is a restoration of the street car on its old line down Chapel Hill St./Kent/Chapel Hill Rd., but with a continuation that looped through a redeveloped Lakewood (which, in my mind, would involve rebuilding the lake at the north end), then would wind its way through the Duke owned woods to the north, and go up either Towerview or around on 751, then go down Erwin Rd. to Main St., where it would close the loop at the new multi-modal station. Based on generic pricing for streetcar systems and the length of the route, even at today's elevated prices this shouldn't cost at most $60 million, and if you could somehow get Talman Trask's wide backside out of the way, you could partner with Duke on the cost, as it would provide a replacement of sorts for their East-West bus. If the city, the feds, and Duke all ponied up $15 mil, which I don't think is all that out of the question, that would leave a $15 mil extra cost for someone who, under the city's transit-oriented development, could put in some pretty high density residential with a commercial component in on that 18 acres, and still have room for a nice park area around the lake that would augment the cemeteries and Duke's forestland nicely. It would also put the developer in control of a giant piece of land that suddenly was a 5 minute trolley ride from west campus. I'd like to be in that position. There was an amusement park in Asheville that sat at the mouth of the Swannanoa River, where it runs into the French Broad, near Biltmore Village. On river clean up days, there was a point that you could see the remnants of an old wooden roller coaster in the low lying areas around the river. I'm not sure if the roller coaster actually went over the water for some distance, or if the shift in the land or a rise in the river left it exposed, but it was in a swampy area that was hard to imagine as an amusement park at the time. Unfortunately, googling kept steering me to links to Ghost Town in the Sky, which is a different thing entirely. Absolutely wonderful post, thanks for sharing. I live nearby and heartily second Michael Bacon's comments about public transportation. I actually LOVE the crazy streetcar idea. With the new plans for Duke's central campus, Anderson and Chapel Hill streets will become more trafficked entryways into campus...this means that 1) Duke has an increasingly vested interest in this neighborhood, and 2) better public transportation options will be a must. THIS IS YOUR BEST BLOG POST EVER! Thanks for the great work. I read this site every day and always enjoy discovering more about Durham's past. Has your group engaged the City Council on this issue? Between the Lakewood Shopping Center's deterioration and the recent changes going on at the YMCA (though, IIRC, they arranged for the DPSS to lease-back the space, or am I imagining that? ), this area is really getting hammered. The first place I stayed in Durham in 1984 was on Lakewood, just a couple of blocks from the shopping center. Since 1988 I’ve been living on the ridge that runs behind the north end of Lakewood. A couple of things to add. In 1984, Kroger and Winn Dixie were still both open. There have been a number of grocery stores since, and a period of a year or two with none. We are sure happy to have the Food Lion. And it’s wonderfully diverse clientele. Along with the other stores mentioned, there also used to be a very nice jewelry store. The Atwater gas station pictured was owned by Bob Atwater’s family. He’s our, (and Chatham’s and Lee’s) NC Senator. I think someone mentioned the barber shop. The name is 40 Below. Duke and UNC B-Ball players are frequent customers. An ACC sports fan place for all kinds of inside info. Dragon Gate isn’t bad for take-out, if you know what’s good. Try the shrimp in garlic sauce. It’s been fascinating to watch the grower Hispanic presence. There’s a band that occasionally plays at Azteca. They are great. The large apartment complex behind the shopping center on the north end deserves special mention, or I should say condemnation. It was built in the ‘70’s, over the protests of the neighborhood. Something like that wouldn’t happen now. It is the most horribly designed building, alas. Lookie loo who made the cover of this week's Indy! You look like a rock star, Gary! Speaking as a geographer, it's great to see so much energy in the Triangle for projects like these. Geography: it's not just states and capitals anymore! If there really are contradictions between spatial maps, narrative storytelling and democracy, Gary Kueber of the popular Endangered Durham blog may be the most likely Triangle dweller to break them down. He started the blog in August '06 "really because there wasn't a go-to resource." The focus has been on preservation advocacy for Durham's underprotected historic buildings. Mapping Durham's architectural and social history is a closely related interest. "A lot of people come here from somewhere else and don't know Durham. That knowledge of how things have changed, that context, is not present for a lot of people here." A first step is to make accessible material from libraries and other archival sources, such as the fragile 1959 aerial photographs he's been posting recently courtesy of the Durham County Library. In a recent blog entry, one of them is put alongside several other photos, maps and written accounts, variously borrowed from the Herald-Sun, Duke's special collections and a few of Kueber's readers, to tell the story of the forgotten Lakewood Amusement Park and its transformation into Lakewood Shopping Center. Ghostly images of the park's many atractions (including a merry-go-round, roller coaster and pool) and the trolley system it was intended to popularize are given historical context by a written account, and located in Durham's contemporary strip-mall landscape with maps. Kueber wants to move on from the Google Maps application programming interface he's currently using to mark the sites from his blog posts to a Web 2.0-based approach that would allow for freer exchange and collaboration. "I'd like for there to be a temporal version of something like Google Earth," he says. Despite the limited functionality of Google's programs, their ability to quickly and easily reach a large audience makes them attractive to mappers of limited means. But the dream of blending scope with finesse remains. "It might be ideally that Google Earth ties in with a diversified local content, so when you drill down to the local level maybe it's not coming from Google servers, but Duke servers, and maybe the state is providing hydrology layers and whatever else ... a relatively seamless marriage between, say, the Google content and our local content." Duke historian Trudi Abel's Digital Durham project shares Kueber's interest in replaying Durham's forgotten history through the medium of computer technology. Since 1999, Abel has been steadily building an online archive documenting Durham's rapid process of industrialization, dating from around 1880 to the early 20th century. Supported by Duke's Center for Instructional Technology, the site includes public and private records, photographs and, of course, maps. While nearly all the material comes from Duke's special collections library, it is now far more widely accessible than ever before. People are noticing. The maps, she tells me, are "a really big search term," and one of the resources she was most eager to upload. One of the first questions Abel asks her students begins with the 1887 map of Durham County: "What piece of town do you live in today? Can you find that area and figure out who owned that piece of land and where they lived?" The maps currently online range from 1881 to 1921 and include parcel data, roads, an aerial tableau, businesses, even ads aimed at developers. They serve as useful counterparts to both the experiential detail of the photographs and personal correspondence and the impersonality of government records. "One of the things that I learned from working with kids in schools, if I only showed them census data, that wasn't so interesting for them," Abel says. "But if I showed them a map, it became a really exciting way of reaching the students." Blending all of these primary sources gives the sort of multifaceted view of history usually reserved for professional historians. Whether eighth graders or undergraduates, Abel's way of teaching history is to expose her students to as many primary sources as possible. It's even better if that experience can spread outside the school to the amateur researcher and concerned citizen. Abel hopes Google Earth will be able to provide a new dimension to understanding Durham. "I'd like to think of it as time travel," she says. Although on their way to having a historical Google Earth "layer" ready by fall, Abel and her assistants have been frustrated by the very thing they're trying to study: the haphazard way Durham's urban environment has changed over time. "One of the challenges with Durham is we've lost almost all those old structures on the 1881 map," Abel says. "Right now, there's only a few structures or landmarks that are left that we can use as a starting place to orient the map and align it with the new satellite imagery. "There is only one downtown building that predates the 1881 map—it's the oldest building in the American Tobacco campus, at the corner of Blackwell and Pettigrew streets. Every other structure is gone." There is something intrinsically ghostly in the thought of Durham's booming past being mapped on to its redeveloping present. "One of the things we can see from this map we've been doing," Abel says, "is that when you look at all those parking lots downtown, what used to be there was, for example, a furniture store. There are parking lots hiding what used to be a lively commercial center of the city, but you wouldn't know that from staring at the empty lots on a Sunday." Great work on the park and Lakewood in general. I learned it was a special place and very popular. It has a storied past but an uncertain future. If anything is to be done at Lakewood, it should reflect its past in some way. I like the crazy idea re: trolley cars. Hey, if the American Tobacco Campus can make it, why couldn't Lakewood? It could be another unique spot that could link to the downtown revitalization. It may have to wait out the economy for the short term however. Keep talking it up! I really enjoyed this post. I've shared my interest with the Planning Director for initiating a focused planning effort to redevelop this site in a form that would take advantage of the location and provide more services and retail opportunities for the neighborhood. Thanks for the info. I spent some of my formative yrs (age 3-7) at 4 Seasons Apt overlooking the Lakewood Shopping Center. I had heard that there was once an amusement park there, but never knew how it had been configured. I grew up on Palmer Street and have very fond memories of Lakewood Shopping Center. When it would snow we would put our sleds on top of the hill next to the bank and could ride all the way to the Center Theater. It was a long walk back up but it was great. I remember the Santa house they would put up beside the Kerr Drug store and Santa would be there during the Christmas season. One year Santa even parachuted into the parking lot. I graduated from Durham High in 1988 and went into the military. I am back now but sometimes find myself going out of the way to drive through the neighborhood and the Shopping center. I even remenber the Center Theater would have The Rocky Horror Picture Show on Fridays and that was an experience in itself! I even remember the Lakewood Party Store and the Video Game room run by a guy named Max in the 80's in the boom of the Arcade Video Games. It was a wonderfol neighborhood to grow up in and the Shopping center was at the heart of it. With all the mention about the Lakewood park Amusement ark and history as well as current status of the Shoppes, you have left out Roll gardens. Roll was the gardener/florist for the Duke family. He was from Germany. Mrs. Duke liked him and told him "one day I am going to set you up in business for yourself". She stuck by the remark and helped him establish the area at the corner of Lakewood and Chapel Hill Road. There was a series of greenhouses as the business grew. There was also a small pond and gardens. It was referred to as Rolls Gardens, very nicely done and frequented by park visitors as a separate but adjunct thing to do while "out of town at the amusement park". His business thrived from the park traffic. The eventual 6 or 7 greenhouses were steam heated for year round. The pipes, foundations and the pond are still there although the pond is not a pond anymore. In 1977 ms. Poe bought the place and ran "Green Thumb Nursery" where she hired kids who were mentaly impaired for work in the last remaining greenhouse she operated that is still visible from the street. She lived in the house next door for years which was built by Rolls. When she moved out to Kerr lake it was rented as an office to Bill Cotter, a friend and a Durham lawyer at that location until 2004. The gardns and the history but more importantly the fact that the Poes never did any significant change (development) to this property is significant. A lot of times local Durham families get a lot of heat for simply owning property. The Poes should all be heartily thanked for what the HAVE NOT done. Mrs. Poe is gone, she will be missed as a true Durham character. I had the pleasure to know and enjoy her company when I lived on James Street (back when lakewood party Store, the ABC, Krogers, Winn Dixie, Kerr Drug, the Center Theatre, Cow Store, Tuba Exchange, YMCA, Satisfactions, Harambee daycare etc.) all were in the general area. It was a community that was a bridge to Duke students and citizens who could walk there and, it will be again. Keep an eye on Roll gardens, good things are happening in Durham. Thanks for the additional info. In response to the question of what could be done to make the shopping center better - I think there is far too much parking for the stores that are there. The other half of the shopping center could be developed. I would like to see the small movie theatre open up as a theatre again. Maybe one that has a mix of Spanish and English language films. This neighborhood could really use some affordable entertainment. I saw Benji at the Lakewood theater along with many others back in the 70's. I can't remember how many screens they had. Does anyone know? Wow, this was a great history lesson for me. I just happened to stubble across you site...the words Lakewood Amusement Park caught my attention. I was born and raised in Durham and I will be 25 at the end of the year. I've lived on the West End all my life. As a young girl I remember shopping at the Woolworth with my mom and going to the theater with my family and friends too. I shop at Lakewood often. I had no idea about the history of Lakewood except what I saw growing up. That is why images are so important; it really opened my eyes. Now I will take out time to research more about this town we live and I will definitely share this history with my family. I am also anxious to see what come out of the time cap as well.Thanks for the information. I wonder if the community can buy it back, whether it can be turned into a more modern but still valuable park where people can make it the community center it used to be. I wanted to mention that the very last reason to me visit Lakewood shopping center is officially gone. Durham's beloved Thriftworld is officially closed for good. The most recent issue (Nov 2009) of the North Carolina-based magazine, Our State, includes an article about a Charlotte amusement area, also called Lakewood Park. This other Lakewood lasted from 1910 until 1933 (quite similarly to ours), was known as Charlotte's Coney Island (quite similarly to ours), and contained many of the amenities that ours did. Wow, many of those pictures brought back memories. I remember Krogers, Woolworths, Grants and the other stores. I worked at the Center Theatre for a short period of time and grew up in this neighborhood. It once was a nice area and unfortunately, when Durham expanded out into the County, folks followed leaving this area to decline. Sad to see it happen. And if anyone remembers, Davis Bakery. They had the best doughnuts in town. I have not found any better ones yet. Cleveland, where I grew up, also had amusement parks at the ends of its streetcar lines (before my time). According to a class I took on Cleveland history, one reason for this was the difficulty of cycling coal-fired power plants. They had excess generating capacity at night, and these amusement parks helped them use it. Pickett's Store was across from the Fire station at Ward and CH Road. Any information on this. It was run by our next door neighbors on Wallace Street. Later on their nephew put a Steak House in Lakewood Shopping Center using a train car as the restaurant itself. It later moved and became the Wabash Steakhouse at the Carolina Duke Motel. I like the history on Lakewood Park, however, sad that only whites were allowed to enjoy it. We as the community in and around Durhams old Lakewood park should come together and raise funds through our elected officials to rebuild a new park in the same areas. I feel we can thrive financially as well as establishing a better future for our children. They can have fun and learn history all at the same time. to DFPope- thanks for naming all those establishments, had forgotten about most of them; my first job was at Thalheimers, and I also worked at the candy shop and the paint store in the 60's. I loved the freedom of being able to walk from home to the shopping center with friends when I was young (mid 60's), and have many great memories from there- ate many hot dogs and french fries at Woolworths, and bought many records there with my saved allowance! -I knew your family, taught with Mrs. Few, and my sister was best friends with Dana. Thank you for the work you did putting this history and the photos together. I grew up visiting my grandmother, Evie Bell Shepherd Phipps, when she lived on Chapel Hill Blvd. in an old house very close to Lakewood Shopping Cnter. That house was standing when the amusement park was there and I have wanted to "see" Lakewood Amusement Park. Now I can. The house I visited on Chapel HIll Blvd. was torn down when I was 7 (circa 1969-1970). It had belonged to my great-grandfather, Charlie Phipps, and great-grandmother, Carnie Kate Weaver Phipps. One of their children, great Uncle Jim Phipps, became a well known judge in Chapel Hill. My grandfather, his brother, was Charlie Reid Phipps. I am sure they all enjoyed the amusement park at some point and it is wonderful to be able to envision them walking about the place. I was born in December 1962 and so remember enjoying Lakewood Shopping Center when it was new. I loved Kerr Drug, and Woolworths, and a clothing store, I guess it was Thalheimers. I also loved the movie theatre. That one spot of land has created a lot of good memories for generations of folks. I remember my Mother telling me of going to dances at Lakewood Park and she had a half sister and brother-in-law (Jeff Wheeler) who lived in the park and Uncle Jeff was a trolley car driver. I was to little to remember very much about the park. Wow! I grew up in lakewood in the 60's on prince st. it is wonderful to see the pictures of the park. All that was left of the park by the 60's was occasionally on super hot days, the tar in chapel hill st might melt enough to reveal the old street car tracks. Oh, yes....Both Krogers and Winn Dixie and they were the main two big grocery stores in southwest Durham. Every Saturday, I would load my kids in the car and we would go do our weekly grocery shopping at Krogers. In the summer, we would come home, unload and make fabulus lunches and head to the Duke Faculty Club for the day. Long lasy days of summer...Sometimes we would pack enough to have a light dinner there before returning home! Also, and I bet most people don't know this, right beside the Kroger Store which was at the North end of the strip mall, there was a little ally where Goldsmith had its first store. Linda was in there all by herself making and repairing beautiful jewelry. Eventually, there was a really cool place that was made up of bunches of little rooms to bring kids...one room was like a play grocery store; one was musical; one was a little play cafe; one was art; there was a fire pole kids could slide down and land on a bunch of pillows...I can't remember the name of it but it was a great place to take your kids on a rainy day. Don't know why someone doesn't create something like that again. Kid could be really creative. This was in the 90's...Anyone remember the name? I laughed when I saw the wording on the Center Theater Time Capsule plaque that commemorated the opening of the new Center Theater when it opened in Lakewood Shopping Center. The theater was to open in December 1966 AD and the plaque was to be opened in 2016 AD (only 3 more years to go now.) The "AD" is what made me laugh. Did they think that in the future some of us might think it had been built in the BC era? This Center Theater was convenient with lots of parking in Lakewood Shopping Center, but before the Lakewood Center we had a wonderful Center Theater in downtown Durham with an absolutely beautiful "curving" staircase with wide brass handrails to the 2nd floor Ladies Lounge and the balcony. The original downtown theater was where Elvis's first movie, "Love Me Tender", was shown the first day it came out. There were throngs of us kids from all of the Durham schools that went to see it right after school was out on that day. Then Elvis was killed at the end of the movie and sniffles could be heard all over the theater. We don't have that beautiful theater anymore, but thank goodness we do have the beautiful Carolina Theater. ooops, in previous comments, i said "goldsmith" when i meant to say "jewelsmith"...sorry! I think at some point the original Winn-Dixie became a Colonial Foods. In the summer Durham Co. Schools offered summer movies for the kids. It was 10 cents per movie and there was a movie one day of the week for 10 weeks while school was out for the summer. I remember having a sheet of 10 movie tickets for the summer. The old Satisfaction was the site of one of my Jordan HS class of '81 graduation parties. I also remember going to Woolworth's when I was kid with a Santa's House in front at Christmas. T.J. Hoops was a big deal for a year or 2. Davis Baking's ginger bread men with raisin eyes and buttons were a childhood treat. The amusement park is a fascinating story. AND the old downtown Center Theatre had the most marvelous art deco-type statues on the newel posts. They were white & curvy, stylized. Of course, I didn't really appreciate them until I was grown & they were gone (didn't even knew what they were). The outside of the theater had a South Beach type ridged design over the entrance & I think colored lights shining on it. I thought it was really fine! Oh, I remember Santa's house. And the gingerbread men were so good! Brings back so many memories! I wish someone had a photo of the Santa house/Santa Claus in the center courtyard at Lakewood Shopping Center 40 years or so ago to submit. I was so scared of that guy! He also flew in on a helicopter. Now that the Scrap Exchange is in the old theater, I hope they will make a big deal out of opening that time capsule! Kathy, I loved your post about watching the Center Theater time capsule go in. I am a member of the board of the Scrap Exchange, which now owns and occupies the old Theater building. We are planning a great party for next year when we take out the time capsule and we would love you to be part of the festivities. Please contact me (Ellen) at the Scrap so we can exchange information. How wonderful it would be to have you there!! Best wishes. This building does not appear in any tours yet. Looking north from Chapel Hill Road, around 1910. 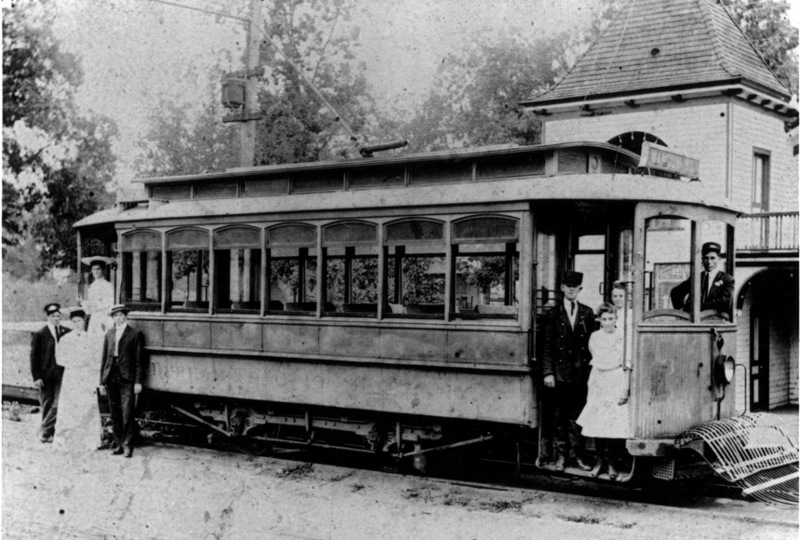 The Durham Traction Company, which purchased the city's streetcar system in 1901, was owned and operated by Richard H. Wright, who started his career in Durham as a partner with Duke family in Duke and Sons Tobacco (he bought out Washington Duke's share upon the elder Duke's retirement.) Wright had a major falling out with the Dukes, accompanied by years of litigation, but became a major real estate developer with the Durham Consolidated Land and Improvement Company, which developed a significant portion of Trinity Heights and Walltown. 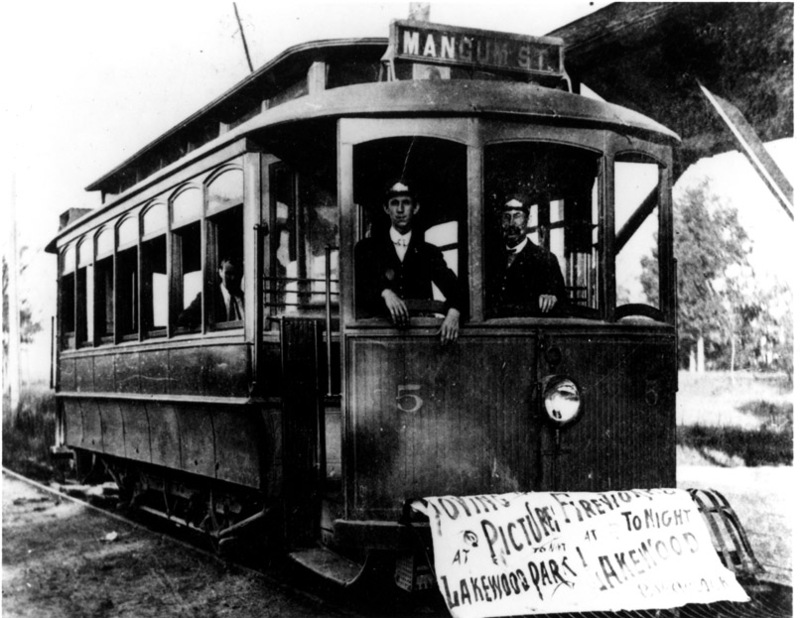 He, along with Julian Carr - his partner in the DCLIC, purchased the old horse-drawn railway and went about converting it to an electric trolley system, powered by an electric plant on Blackwell St.
One strategy in bolstering ridership on the streetcar line was to build an amenity - a destination - at the end of the line. This was done in more than a few cities, and Richard Wright sought to create this destination in Durham through the development of Lakewood Amusement Park. The area around Lakewood Park was a sparsely developed, rural area along the Chapel Hill Road south of Maplewood Cemetery (the previous end of the streetcar line,) and the site itself was low-lying land on the north side of the road. A stream running through this land had been dammed up sometime in the late 1800s to form a shallow lake, which was a popular spot for summer swimming and baptisms. Wright extended the streetcar line to this spot, and began developing entertainment and diversions on the open land around 1900. This included a multitude of frame buildings with concessions, games, dancing, rides and more. 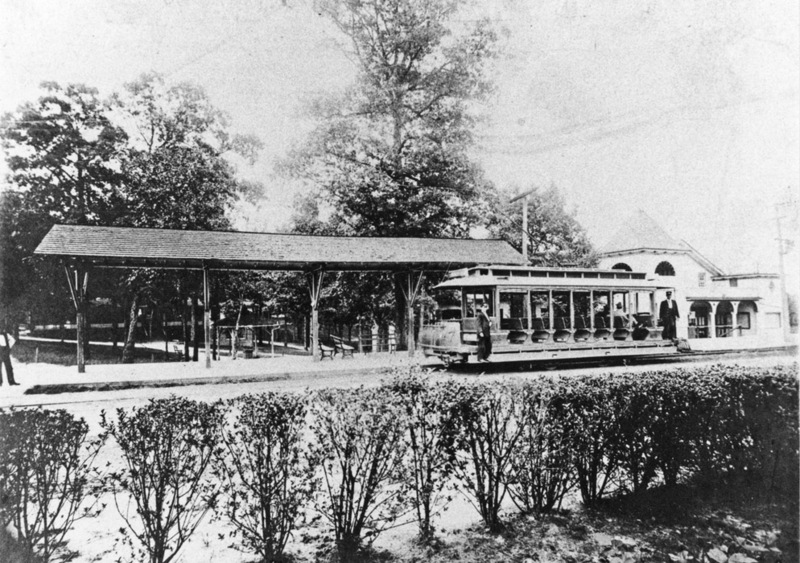 Wright extended the streetcar line to have two stops at the park - one at "The Casino", where theater performances were held, and another a bit further southwest, at the main entrance to the park. Interestingly, despite the fact that, in other cities, the builders of such systems often took advantage of the cheap land along the new line to develop houses - which suddenly had significantly higher value due to their construction of the line. (Something we can't seem to understand in today's climate.) Despite his other real estate efforts, including his eponymous corner downtown Wright did not develop real estate in Lakewood. Lakewood Park opened Sunday afternoon July 20, 1902. The park was crowded from opening day, with its multitude of colored electric lights. You have to imagine the spectacle of open air entertainment lit by hundreds of electric bulbs, at night - something unheard of at that point in time. "Nearly all the seats had been taken when we boarded the trolley at Five Points. The nonchalance of the conductor was in marked contrast to our enthusiasm as he walked about a platform on the outside of the car and retrieved fares through the open windows. At each stop out Chapel Hill Street, the car became more crowded - as if everyone were going to the same place. The car rounded the curve at Maplewood Cemetery. In another 10 minutes, we'd be there... Lakewood Park." The streetcar would first stop at the Casino, at the corner of Chapel Hill Road and Lakewood Avenue, across from Rolls Florist. The Casino was a rather large wooden building with lots of lights around the entrance. Inside was a huge auditorium with rows of opera-type seats and a big stage with velvet curtains. Enormous crowds would gather to see shows. In the summer months, summer stock companies would travel to Durham to give performances. There were shows nightly, using professional actors and local talent, including many locals used as extras, and "laughter [would float] through shuttered windows of the Casino" during performances. The theater at the Casino was run by David Runkel and his Runkel Stock Company. The Runkels lived next-door at 1807 Lakewood Ave. The streetcar stopped in front of the Casino. Rear view of the Casino. The next stop of the streetcar was the entrance to the park. As you would enter, on the left side of the walkway was a large field. It was used for different things, one being a baseball field. At times it was used for a parking lot, and at other times it was used for tent meetings, and termed 'Evangelist Green'. It was a spot of high emotion that "stirred people to doubt their salvation." Likely the entry of the park (in the background) - this is a shot of one of Sidney Rochelle's bicycle outings. Rochelle lived just up the road on Chapel Hill Road. Note that this photo is unlabeled, and I can't confirm that it is of Lakewood. There were lots of outdoor benches where you could sit and enjoy seeing friends and people walking along the walkways (the Midway.) People would bring picnic lunches, and at night it was cool and relaxing. The Light and Traction Company had hired a man named Tom Foster to manage the park. Mr. Foster would invite churches to come to the park for picnics. Sometimes there would be 2 or 3 on the same day. He would eat with each of them. As a treat, he would give them free tickets to ride the merry-go-round. People would eat watermelon slicings and you could smell barbecue cooking. The first building past the main entrance was the drink stand - there was a large opening when you entered. The doors folded back, and inside was a long soda fountain, where you could buy an ice cream cone (chocolate, strawberry, or vanilla) or a soda or an orange drink. In back was a large room with tables and chairs where you could go and relax and enjoy a soda. The windows would open on both bottom and top. 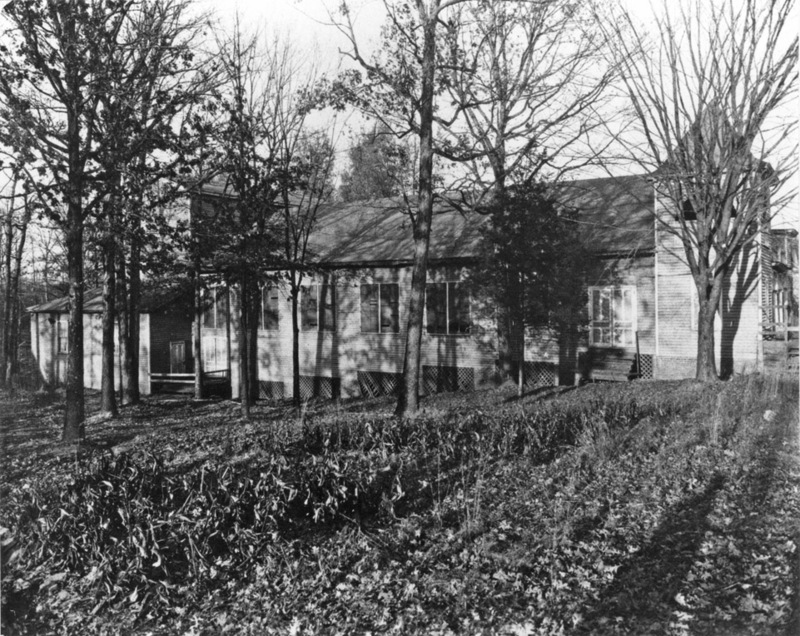 Mr. Foster's office was also in this building, which also had a music room where records were played for the entire park. When leaving the drink stand, and only a short distance away, was the merry-go-round. It had a fence around it so the children would not get hurt. There were lights and "wheezy organ music" and brightly painted horses that children all wanted to ride. A ticket cost 5 cents. The first merry-go-round was operated by Emmit Rigsbee and Charley Proctor. On the west side of the merry-go-round was a line of concessions. At the first, you could try to knock the wooden milk bottles off of a shelf, which cost a dime for three balls. Next was the shooting gallery. It was protected with heavy metal on the back and sides for safety. There were two chains moving across the back: one had ducks, the other squirrels. For 25 cents you would get 3 shots with a .22 rifle to try to knock a duck or squirrel over as they passed by. Next was a place where children could try to catch a fish. There was a metal circular trough about 14 in. wide and 12 in. deep with a pump that would make the water go around like a river stream. There were metal fish, each with a hook on its head, that moved with the flow of the water that people would try to catch. Some of the fish had a number. If you caught one with a number you would win a prize. It cost 10 cents to fish. Next was the doll house, a place where there were three rows of dolls sitting tight on each board about 15 feet back. The dolls were small with a lot of feathers around them. If you didn't hit a doll the ball would go through the feathers and would not knock the doll off. It cost 10 cents for three balls. Just north of this was the skating rink, which was a center attraction. The roller skating rink was vast in size - a very large wooden building about 200 feet long and 50 feet wide, with music playing at all times to entertain the crowds, mingling with "the grinding roar of a hundred rolling wheels on the skating rink floor." It had a porch at the entrance, and inside there were bleacher type seats, about 3 seats high where people could sit and watch the skaters. You could rent skates, which cost 25 cents an hour. At times professional skaters would come in and do all types of tricks on roller skates. Across from the skating rink was the pavilion, another large building, which called the Dance Hall by some. The sides were open, and typically an orchestra or band was playing; orchestras came from all over to perform while the crowds danced the night away. Joe King's orchestra was a popular act. Other people would sit around on benches and just listen to music. It was also used for other things, such boxing and wrestling. If it looked like rain and a picnic was scheduled, it would be in the pavilion. Lakewood Park, possibly the pavilion and a gazebo in the background. Same area as just above, from the other direction. "Mr. Foster was always looking for something new that the people would enjoy. He would have small circuses, carnivals, and magician shows. One year he had a hot air balloon with the gondola below. Either the man or his wife would ride when the balloon was turned loose. All the people were excited. They had not seen a hot air balloon before. The next year there was the high diving horse. He would walk up a long ramp to a platform that was 30 or 40 feet above the water and dive in. The water hole was about 30 feet square, and about 25 feet deep. A man and his wife at different times would ride the horse when he would dive. There was always a crowd when it was time for the horse to dive." Several couples even married at the top of the platform and 'consummated' their marriage by diving off the platform with the horse. Carnivals would come occasionally to 'add to the activity', replete with "gypsies." This was also the area to watch the "brilliant" fireworks. The fireworks display on the 4th of July was said by many to be the best, by far, they had ever seen, and the crowds were "so vast you could hardly move." Moving northward from the pavilion was the bowling alley; it too was a wooden building. There were 2 bowling lanes, with ten pins or "duck pins." On the other side of the bowling alley was a place enclosed with a net. There was a baseball throwing machine. The chain had a cup for the ball. As the chain moved around it would throw the balls for you to try and hit. On the back was a large bull's eye. If you were lucky and hit the bull's eye, you would get a home run. You could get a triple, double, a single, or strike out. In front of the bowling alley was the roller coaster. People would stand around watching; some in line to buy a ticket. It was 25 cents a ride. There were 3 cars that would seat six people each. Each car would lock onto a chain that would pull the cars up a steep incline to the top, which was about 65 feet high. Then the thrill would really begin. As the cars would turn the curve and head down the long incline, the children would be screaming as the car turned and twisted about the curves to the place where they started. The Lakewood Park roller coaster. Down from the roller coaster was the old lake, which had predated the park. It had a mud bottom. Several springs supplied water for the lake, which was about 1/2 acre in size. The dam was made of dirt, and was on the lower side. It was drained soon after a new concrete pool was opened. The new pool was modern, and advertised as "the most sanitary pool in the south," with dressing rooms and a shower. When you changed clothes you would put them in a box and check them in at the ticket office. The pool was about 2 feet deep at the shallow end and about 8 feet deep at the deep end with a high dive and spring boards. During the summer when it was hot, it would be very crowded. Up from the pool was a large playground for the children. There were lots of swings, sliding boards, see-saws, and sandboxes. "Crowds assembled for the opening [of Lakewood Park] to watch the turning on of strings of colored lights along paths and around the numerous buildings. From that moment the park was highly popular in mild weather. For children the chief attractions were the merry-go-round and the roller coaster (5 cents a ride on each.,) although the open pavillion where ice cream and soft drinks were sold was not far behind. Other facilities appealed to adults, especially in the long twilights and evenings: the skating rink, dance pavillion, and much less frequently, the swimming pool. Least used was a large wooden theatre. 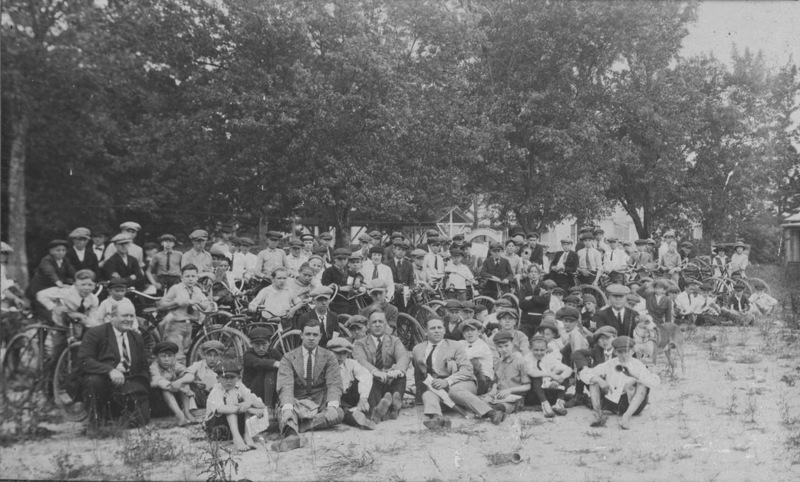 Lakewood Park was a popular place for picnics, large and small; occasionally a Sunday School chartered trolley cars to transport its entire membership to the park for free rides and a picnic lunch. Mothers of small children found the park a boon for entertaining their charges on sommer afternoons. Durham County used the park's baseball field for its Fairs in the autumn." During the early part of the 20th century, Lakewood was a beloved destination for people of Durham as well as a much wider geographic area. Part of the reason for this was extensive advertising. The advertisements, including large billboard signs for the "Coney Island of the South" showed people sitting on a beach in swimwear. The story goes, this resulted in a man from "up north" calling to reserve a "room overlooking the water." The Casino operated for many years behind the vision and talent of David Runkel. However, Mr. Runkel died prematurely following an operation for appendicitis; the Casino closed soon after his death and was torn down by the 1920s. Things were changing by the 1920s; the automobile was becoming very popular, and people who could afford one were buying. They were going for a ride or visiting relatives, or visiting friends out of town - not to the park as before. In 1929 and 1930, with the arrival of the Depression, fewer were coming to the park and less dollars were being spent. The Durham Traction Company sold the streetcar system to the Durham Public Service Company and the streetcar lines were shut down. The last streetcar was discarded in 1932 - many of them loaded onto train cars and shipped to other cities. Mr. Foster continued to operate the park until his lease expired. The Durham Public Service Company wanted him to operate the park on a 1-year lease, but he would not accept the offer. It closed in 1932. The Durham Public Service Company then hired a manager to operate the park. His name was Mr. Vidal and he reopened the park in 1934-35, but it then closed again for good. The land was sold to Mrs. William Preston Few. The buildings were torn down sometime between 1937 and 1953, and the forest took back the park. Sanborn Map of the park in 1937, after closure of the park - the casino and several other buildings are already gone. "The dam for the original pool still remained a bleak reminder of that other day when the writer last roamed the area. The concrete pool, long unused, is still in its place. All other signs of the once popular pleasure resort long since have disappeared." An aerial of the site of Lakewood Park, 1959. You can just make out the squared outline of the old pool just under where someone wrote the number "5" on the original photo. By 1962, the land was sold and one of Durham's early shopping centers began construction. Looking south from the property towards Chapel Hill Road, 07.12.62. A more straight-on view of the shopping center, further along in construction. From Chapel Hill Road, a bit further along in construction. Completion of the entrance to Lakewood Shopping Center. I find it a bit amusing how the proprietors sought to bring the good elements of the old way with them - so the Woolworth's at the shopping center would have the same lunch counter that the Woolworth's downtown did. The Woolworths lunch counter, Lakewood. By 1966, the Center theater left their original location downtown and built a new theater at the north end of the parking lot - somewhere in the middle of what would have been the old lake. My first encounter with the shopping center came in the late 1980s, when I first came to Durham to go to Duke. It was then the "Shoppes at Lakewood" and we would go to Satisfaction's, which was a lot smaller, but more cozy. We also joined a sports bar, with its own basketball court and a lot of pool tables, called TJ Hoops. We'd go to movies at the movie theater - I can't remember if it was still called the Center at that point. The shopping center was fading already at that point, as retailers had absconded from all of the 60s era shopping centers to the malls - mostly South Square, or shut down. Satisfaction's moved to Brightleaf around 1993, I believe. The movie theater was shut down by the mid-90s. The Center's time capsule, mid-1990s. The Duke surplus store moved here from the Cary Lumber Company buildings around 1997 and was a destination at the center until closing up for good in June 2007. The center had makeover to look like any other mini-mall/shopping center, USA a few years ago. Since the Blue Nile Ethiopian restaurant and Duke Surplus closed, I have no reason to go there. As ugly as this example of urban form is, and as anti-pedestrian as it is, I guess the neighborhood at least has a grocery store. But this center could be so much more - what an amazing spot this could be for a dense, mixed-use development that integrates with the community - one that provided parking, but wasn't dominated by parking like this. Unfortunately, like most shopping centers, this one is owned by some out-of-town group that has a portfolio of properties, and that cares little about the community or anything about Durham - other than what kind of return they get on their leases. But to some degree, the problem is us. We, as a general public, expect easy parking-on-demand, and no more than a few seconds walk to the store from our cars. Retailers know it, and expect copious free parking if they are to sign a lease. Developers need leases, and thus build lots of parking. Surface parking is much cheaper than structured parking, and voila - The above bleakness is born. Perhaps expensive gas will change this, but we need to provide decent, efficient public transportation. It won't go everywhere, and that's just how it is. Where it does go, and if it operates efficiently (time) and competitively (price), economic development will occur - this is what studies show about fixed-guideway transit systems (rail, dedicated roadway bus systems). Because the route is fixed and certain, people feel confident in development and retail investment. We can take advantage of this, in the way that Richard Wright didn't, but many others did. By allowing the appreciation in land values to help pay for the construction, we can help fund a rejuvenation of the kind of civilized urban form people once enjoyed - before the false dream - the 'time-saving' advantages of modernism - lured us to thinking we would struggle to fill our free time with all the time saved by not walking, by buying in bulk from the supermarket, etc. Instead we speed from place to place in our vehicles, multi-tasking on smartphones while call-waiting beeps and 6 emails demand more time and attention. Is that our American Dream? Are our lives any freer and more fulfilling for the 'speed' and freedom-of-route that the car culture promised? Because a ride on the Lakewood Park trolley, with the breeze flowing through the open windows as we ride past the cemetery and turn down Chapel Hill road - strains of music from the orchestra floating through the air and the anticipation of watermelon, barbeque, and an orange soda rumbling in my belly sounds like pretty nice way to spend a day to me. Lakewood Park buildings, overlaid on a 2007 satellite image. I really enjoyed this post.